The wall art leads to the entrance of On the Rocks at Sheraton Park Hotel. The lower level of OTR reminds me of a library. The bar counter dominates the ground floor, vertical shelves rise up to the next level. It's not books on the shelves but bottles of wine and other fine spirits, complete with a ladder to access the higher reaches. OTR, a fine dine restaurant with a bar, has turned 6 and its signature dishes are being showcased till the end of the month. 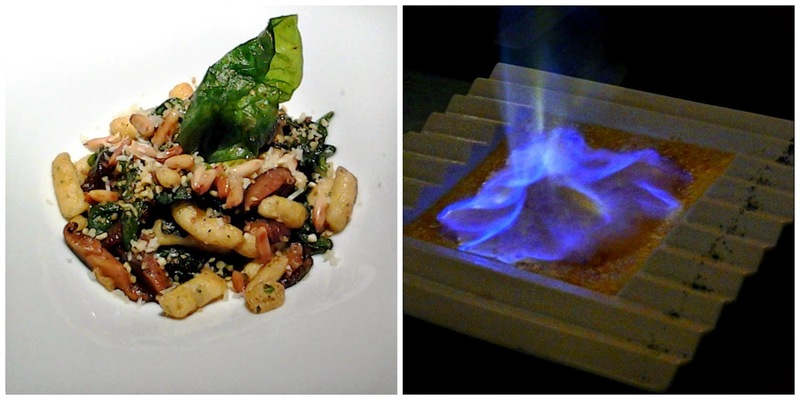 Food is cooked on grill plates and lava stones, the latter done at the table. In fact at OTR, the theme is all about grills, roasts, bakes and flambes. The restaurant opens at 6 every evening, it's a good place to unwind after a busy work day. A singer is perched on a chair beside the bar, her soothing voice the perfect balm for harried souls. We are seated at the upper level, focus lights brighten just the centre of the table giving a sense of anonymity to the diner. The charming PR Manager explained the concept to us. 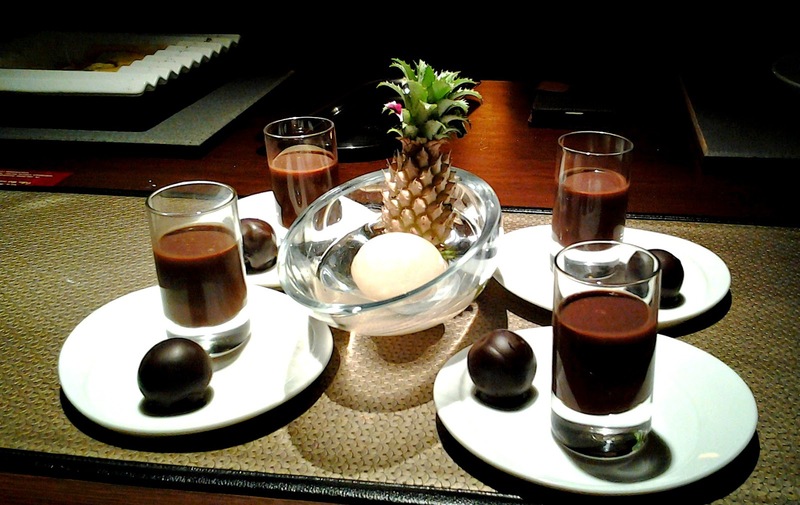 A 4 course menu would be served, starting with an appetiser and ending with dessert. We perused the tablet menus and thankfully, the F&B guys were more than happy to help us navigate and make our choices. My friend chose the grill plate and I the rock. Being the Lenten season, we declined the pairing wines and chose mocktails instead - Italian Smooch with ginger ale and lime for her and Blue Dot, a concoction of blueberry, pineapple juice and ice cream for me. Nice choices! Service started with OTR's signature supersoft focaccia with roasted garlic and a mixed vegetable dip. All manner of roasted vegetables had found their way into the creamy mash which also had piquant bursts of tang and heat. Semolina gnocchi with wild mushrooms, baby spinach, garlic, panko and pine nuts read the vegetarian appetiser description. 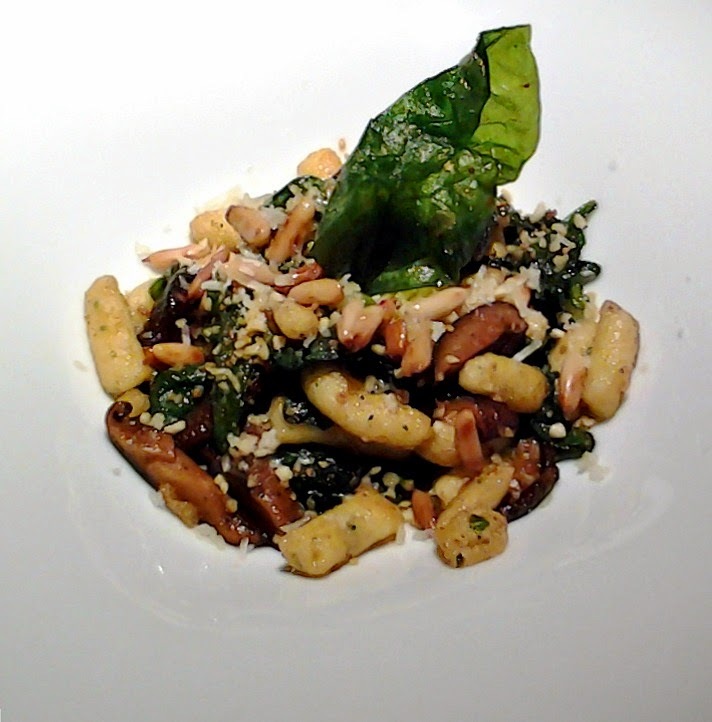 A play of textures of smooth gnocchi, chewy, earthy mushroom slices, crunchy pine nuts and crisp panko. The baby spinach was virtuously healthy and added colour to the dish. The veg main dish was grilled wild mushrooms with fig, fettuccine and taleggio dolce and a carrot soup. There was a mix of mushrooms that included enoki, morel and button, herbs and pasta topped with the soft cheese. The mushrooms were delicious, no sign nor taste of fig though. The fettuccine, cooked al dente, was a tad dry so another serving of fettuccine was brought. 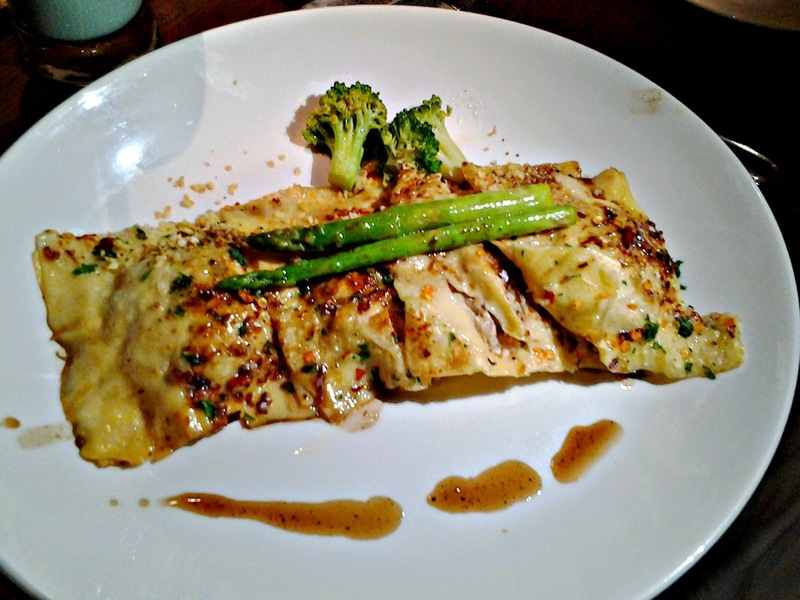 This time, it was cooked a little more but had been merely tossed with a little olive oil and chilli flakes. The cheese topping was sorely missed. 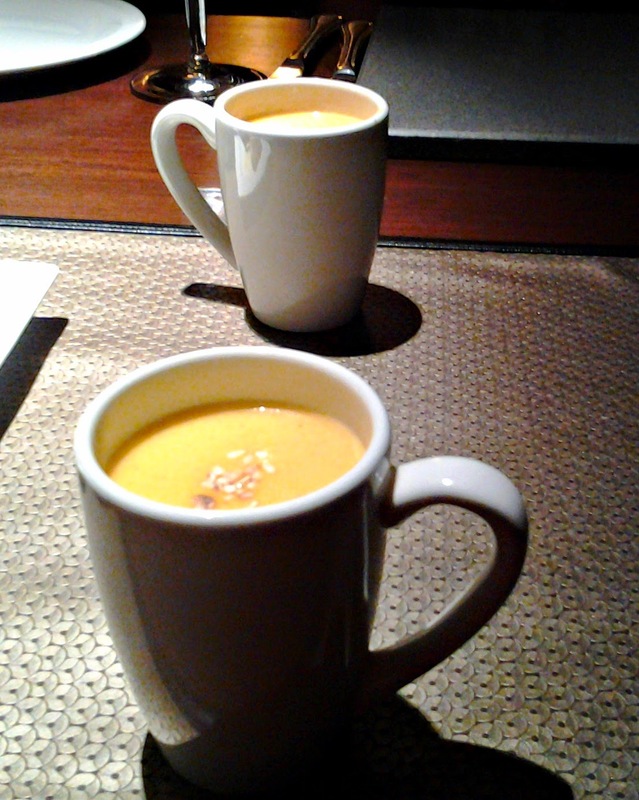 However, the roasted carrot and sesame soup more than made up for it - utterly delicious, smooth and full of flavour. If carrot can taste this good, I'm going to have it every day of my life. Roast chicken ravioli with roast chicken juices, another main, had plump pasta envelopes filled with bits of roast chicken.Maybe it was a bad day for pasta - the filling was quite dry and there was so little of the jus. Pity as it was delicious. The presentation was subtle and restrained. Difficult choices to make - New Zealand rack of lamb, premium cuts of meat, breast of chicken and prawns were offered as mains on the hot stone menu; I opted for the jumbo prawns to be accompanied by vegetables and a jacket potato with sour cream, cheese and chive sauce. A lava stone heated to 400 degrees and placed on a tempered plate was brought to the table. Salt was sprinkled on the stone to prevent meat from sticking to it and then 4 huge prawns were placed on the surface. As it sizzled, Kevin, the F&B executive who has been with OTR since its inception, showed me how to turn the prawns around and cut the meat into smaller pieces so that all the surfaces would cook evenly. I chose 3 sauces - honey mustard, a delicious wine cilantro and a herb butter that was brushed on the prawns. I chose not to season the prawns to allow the freshness of the prawn to shine through and wasn't disappointed at all. None of the meats for the hot stone are marinated, the quality of the meat makes marination redundant. Seasonings and olive oil are placed on the table so the diner can play chef. Oh and with a choice of 16 sauces, flavours get lifted to another level. The main courses are quite filling but when the dessert menu came around, we succumbed and ordered hot brioche doughnuts with raspberry coulis and vanilla sauce, chocolate truffle dome with truffle oil, creme brulee and a serving of the day's ice cream flavour - mocha. The doughnuts, being eggless were quite bland, the accompanying sauces brought them to life. Mocha is usually a hit and miss flavour but the house made ice cream was perfectly flavour-balanced. Chocolate chips and smooth ice cream completed the marriage. 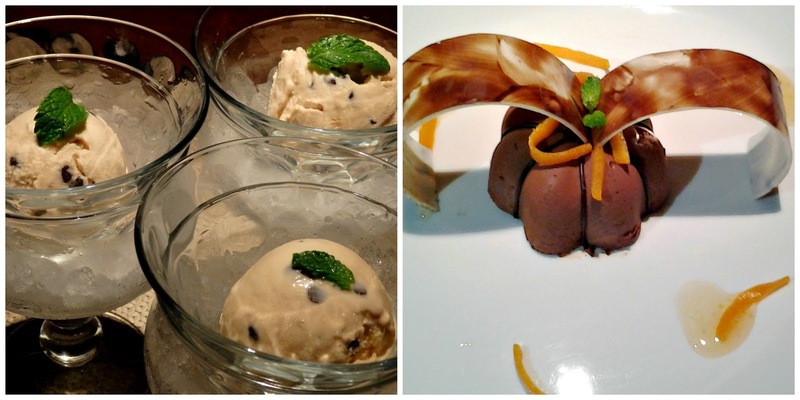 We loved the truffle dome, a rich decadent mousse with hints of orange. 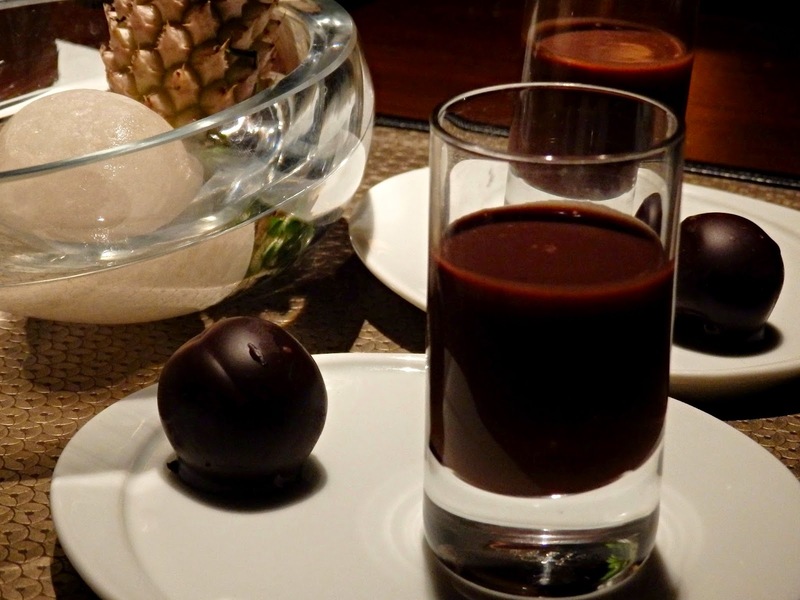 This one will satisfy all your chocolate cravings and then some more. Be warned that the serving of creme brulee is quite large. It was brought to the table along with a snifter of Cointreau which was warmed, set alight and poured over the custard. Drama all right. It tasted superb and the silken texture of the custard was punctuated only by the crunch of caramelised sugar. We thought we were done but no, the restaurant decided to pull out all the stops and brought us chocolate shooters with a truffle. It was died-and-went-to-heaven good. Happy birthday indeed, OTR! All birthday party attendees get return gifts. This was ours. I used some in an omelette. Can a humble omelette taste so good? In all respects, it was substantial meal. For us, it was a mid week treat - for a couple of hours, we could forget work and deadlines and savour a truly continental meal. Service was efficient and discreet. The 6th anniversary menu, as mentioned earlier, will be on till the end of March. It's an a-la-carte menu and a meal for 2 will cost around 7000/- ++. For more information, call 044 42992008. That is such a lip-smacking read! !